These recipes came from Simply Recipes, and were easy and delicious! 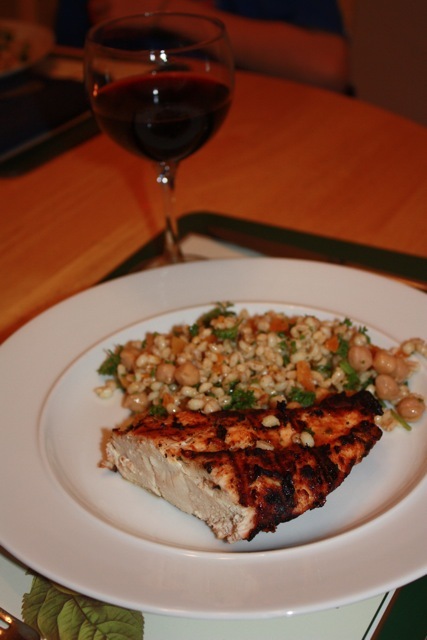 Moroccan grilled chicken and chickpea barley salad. I love the tender juiciness of chicken that marinates in yogurt sauces! And as the recipe says, it’s easy to mix up before work and throw it on the grill when you get home. Our youngest had a great time mixing up the ras el hanout for the salad…loved all the measuring and making something his parents had never had before!